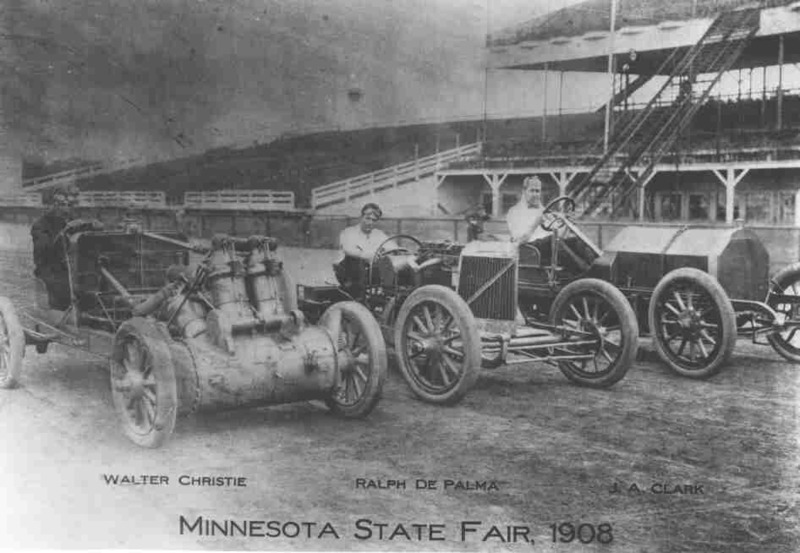 A 24 Hour endurance auto race was held in Minnesota in 1907 and the winner traveled over 1,000 miles? 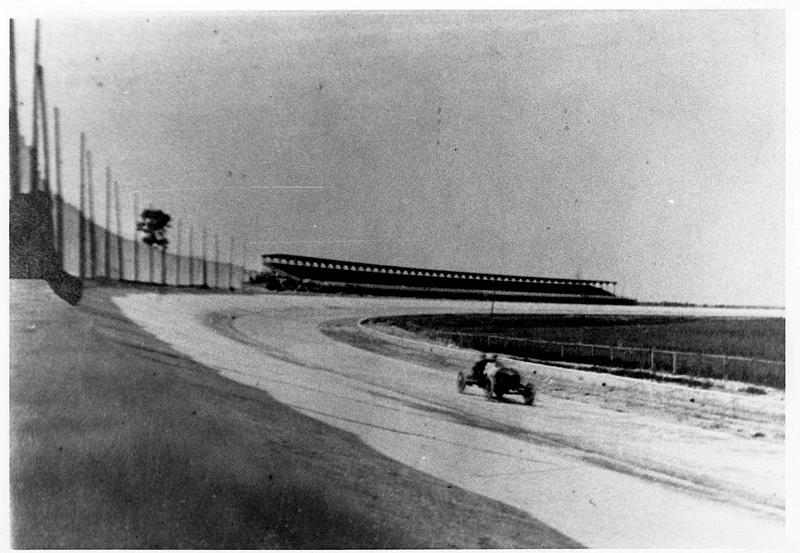 The MN state fair had numerous high profile auto races in the early 1900's but did you know a 2 mile Super Speedway made of concrete was built just North West of Fort Snelling? 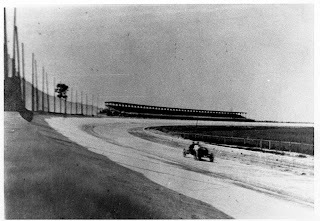 They had a race in 1915 that had a $50,000 purse... in 1915! The track was short-lived but it was built and it was raced on. 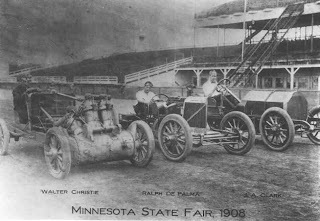 Here is a link to a great article about early MN racing history. Here is another story about the "Minneapolis 500"
Trevor Bayne "saves the day"
Congrats to Daytona 500 winner Trevor Bayne! 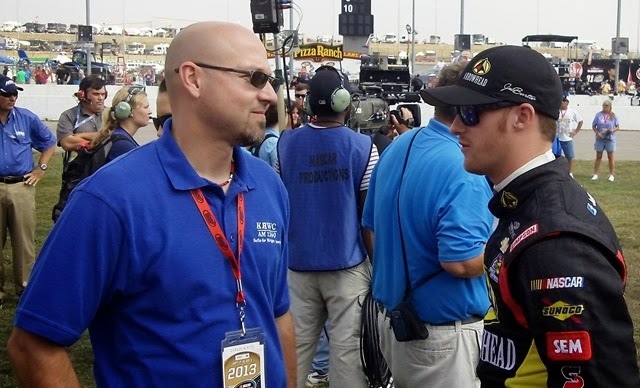 We met Trevor during the 2010 Iowa Speedway Race, here is the story on how Trevor "saved the day" for me on my first day covering a big time NASCAR race. 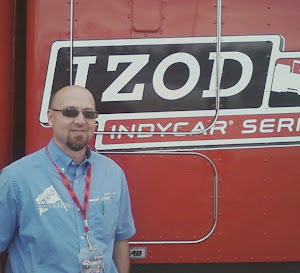 I had a great time covering the Nationwide race at Iowa Speedway on Saturday night (July 31st). 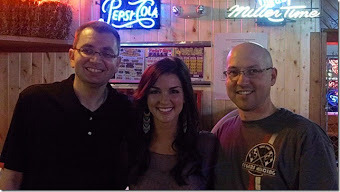 The staff is top-notch and very helpful for the media members. 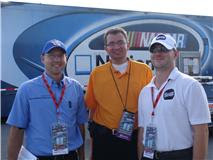 Since this is our only trip to a NASCAR event in 2010, I wanted to have as much contact with the drivers as possible. 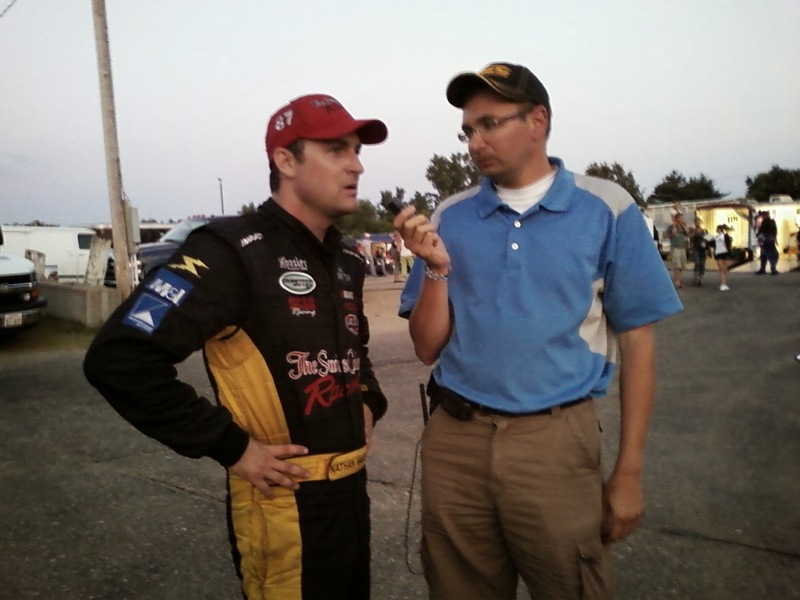 Steve French, the media relations specialist at Iowa Speedway asked me what driver we wanted to interview on our live broadcast Saturday morning and he would set it up. The double duty drivers were off-limits because of their travel schedule back and forth from Pocono PA. I requested #99 Trevor Bayne (who had won two straight pole awards). 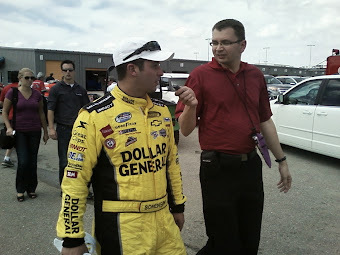 Dean Reller, Jordan Bianchi and I had full access to the garage area and media center but, I quickly found out that the drivers spend very little time in the garage area, they are in their motor coaches most of the time and not available to the media. Since the practice was rained out on Friday, the one and only practice on Saturday morning was during the broadcast of our radio show, so we were not able to interview Trevor as previously scheduled. We just discussed all things NASCAR for most of the show and it went well. The only driver contact I was able to have during the race was when they crashed and drove to the garage area. 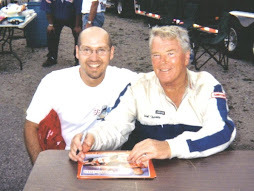 So, I developed the "garage plan," also known as, "hanging around the pits." I spoke to Reed Sorenson (pictured above) and he said the crash was "a problem with the brakes and not debris," he was bummed because its their first DNF of the season and they are running hard for owners points. He also mentioned that he is "race to race" driving the Red Bull car in the NASCAR Sprint Cup series. 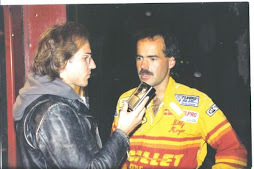 Paul Menard declined an interview request after having a wreck filled night, but he said he does remember the days he raced at I-94 Raceway in Sauk Centre (MN) in the Legends cars. After the race was over ESPN took over pit lane and grabbed the top 3 finishers, I knew they would do a media press conference later but the drivers would not be available for one-on-one interviews. So, my game plan was to wait in the garage area after the checkered flag to interveiw the drivers. Unfortunately for me, all the drivers got out of their cars on pit lane and proceeded immediately to their motor coaches on the other end of pit lane! They compeletely avoided the pits and the rest of the media. 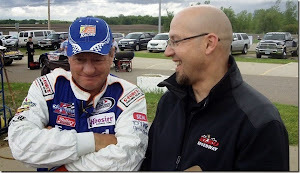 I even missed ASA Midwest tour driver Tim Schendel, who made the race but was a "start and park" driver. It didn't take me long to realize the only guys in drivers suits were the crew members cleaning up the pit lane. I really blew it, my plan was flawed from the start. 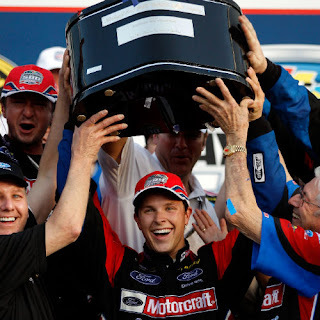 Just then, as I was cursing myself for the bone-headed mistake of the year... strutting down pit lane was a good looking kid with a big smile in a blue driving suit, walking past his Aarons dream machine, it was Trevor Bayne, the driver of Michael Waltrip racing #99. None of the other media was around, here's my chance, it was sheer luck! He stopped on pit lane for an interview. He talked about how he was proud of his guys and really excited about winning his third straight pole award. He said the car was "strong all night, it just got a little tight near the end." He thought the crowd was "unbelieveable, they do a great job promoting this place, we dont get half this crowd at some places" said Bayne. 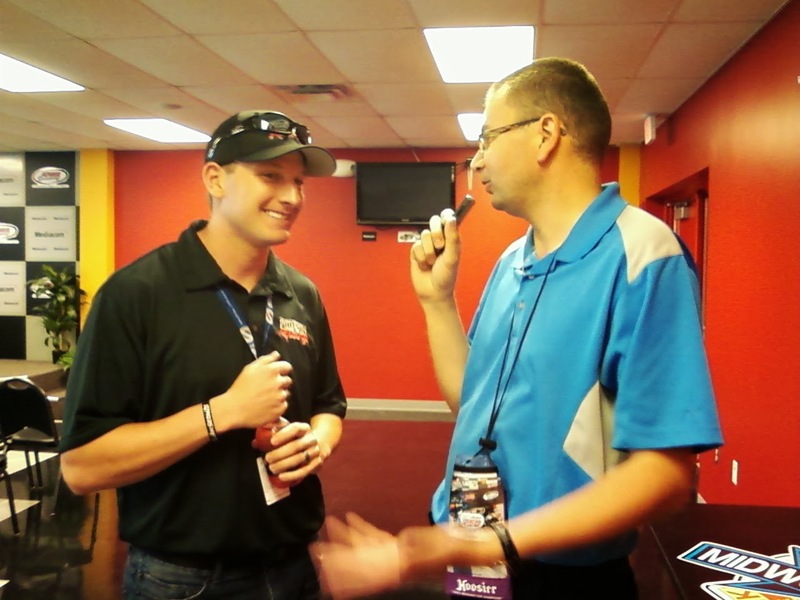 The interview turned out great, despite my "garage plan" miscalculation because Trevor Bayne saved the day for me. 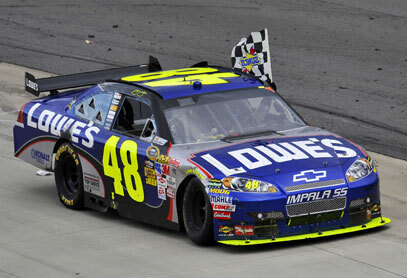 Jimmie Johnson will win his 6th consecutive NASCAR Cup championship in 2011 according to both Dean Reller and Jordan Bianchi. No reason to believe that the winning combo of Hendrick Motorsports, Chad Knaus and Jimmie Johnson will not do it again (and again). Jason Searcy predicts that Kyle Busch will win his first title this year. He is newly married and seems more mature in 2011, most of all he knows how to win. This is the year "Rowdy" will knock the "Ice man" off the top of the hill. Chris Hawkey from KFAN Motorsports and Mike Dimmick from MotorHead Monday both pick Kevin Harvick to win the Championship. Dan Plan from http://www.theracingconnection.com/ will take Carl Edwards racing the New Ford engine to win the Cup Championship in 2011. 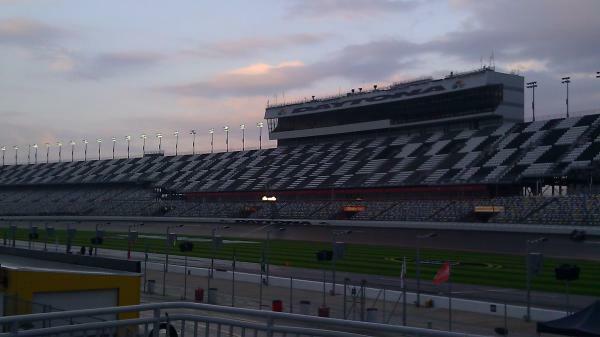 Jordan Bianchi from http://www.theracinggeek.com/ will be reporting LIVE from Daytona, he will join Jason Searcy and Dean Reller will all the up to the minute NASCAR news and commentary. We will talk about that sad day ten years ago when Dale Earnhardt died, and how the sport has changed in the decade since his passing. We will discuss all the off season changes in NASCAR. The rules, the cars, the fuel, the teams, the points, so much has changed in just a few months. How will that affect the racing in 2011? We will make our picks for the Daytona race and also rank the top drivers of 2011 so you will be ready for your fantasy NASCAR draft. Dan Plan, Mike Dimmick, Susie Wiegele, Mr Mom and Chris Hawkey all will release their 2011 predictions as well on the show, dont miss it! 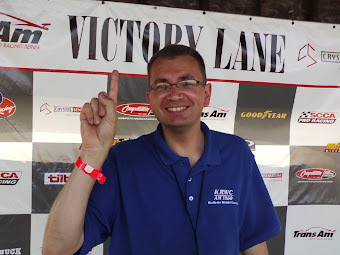 Lots has changed on the local scene as well, we will preview the upcoming ASA Midwest tour series and talk about what is new for 2011 on the short tracks in Minnesota.